The global Directed Energy Weapons market is projected to be around $1.68 billion in 2017 and is expected to reach $4 billion in 2025, growing at a CAGR of 11.5% from 2017 to 2025, according Market Forecast's new market study titled: “Directed Energy Weapons - Global Technology & Market Forecast to 2025”. The global market is driven by the growth in demand for precision strike weapons. While, arm transfer regulation imposed on import and export of smart weapons pose as the major restraint for this market. 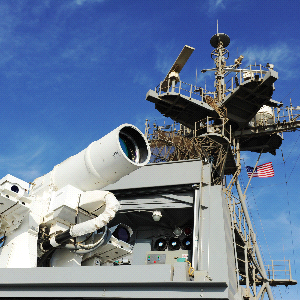 The report goes in depth to explain why High Energy Laser Weapons is probably the only viable offensive Directed Energy Weapon that will emerge within the next 5 years. The report further states that the United States, China and Russia are the market leaders in the development of Directed Energy Weapons. This report is focused on giving a detail-view of the complete Directed Energy Weapons industry with regards to the products market with detailed market segmentations, combined with qualitative analysis at each and every aspect of the classifications done by technology, devices, characteristics, products, geography, and country. All the numbers are forecasted till 2025 to give a glimpse of the potential revenue base in this market. This report consists of a detailed description of the global Directed Energy Weapons market on the basis of systems, end users, service, components, and geography over the next eight years. The report discusses the industry, market, and technology trends which currently prevail in this market. On the basis of products, the global market is categorized into High Energy Laser Weapons , High Power Microwave Weapons and Particle Beam Weapons. Each of these products is further classified into sub-segments on the basis of technology and platform. The various platforms considered in this report are ship based DEW, airborne DEW and land based DEW.